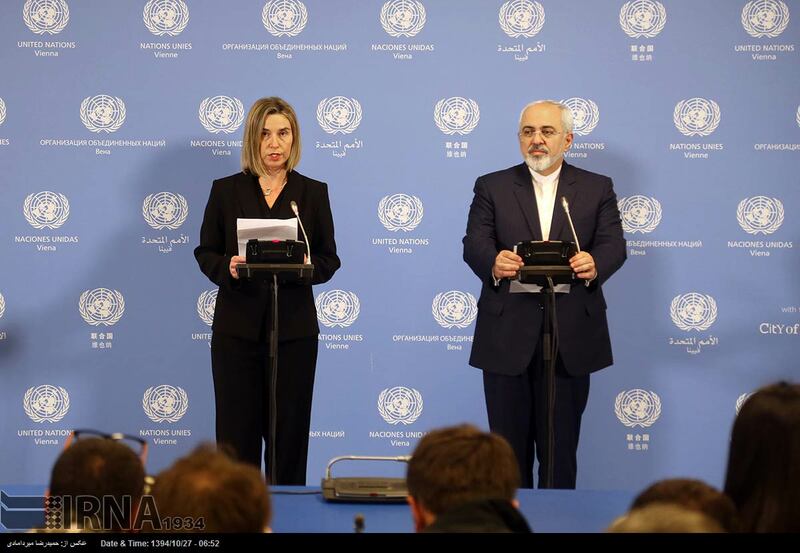 Iran and the European Union have agreed that Tehran has kept its nuclear promises under an agreement reached in July.Iranian Foreign Minister Mohammad Javad Zarif and the EU's foreign policy chief Federica Mogherini announced the agreement at a press conference in Vienna on January 16. The European Union's foreign policy chief Federica Mogherini announced the lifting of economic sanctions on Iran after the International Atomic Energy Agency reported the country had complied with its commitments under a nuclear deal reached in July. Iranian Foreign Minister Mohammad Javad Zarif was at her side at a press conference in Vienna on January 16. The two leaders said in a joint statement, "This achievement clearly demonstrates that, with political will, perseverance, and through multilateral diplomacy, we can solve the most difficult issues and find practical solutions that are effectively implemented." The agreement is backed by the United States, whose top diplomat John Kerry took part in meetings in Vienna on January 16 but was not at the press conference. The announcement set off a rapid process of lifting international sanctions against Iran. The EU's European Council issued a statement saying it has "lifted all economic and financial sanctions against Iran related to the nuclear program." In Washington, U.S. President Barack Obama issued an executive order revoking U.S. sanctions on transactions by non-Americans with the Central Bank of Iran and the National Iranian Oil Company. A White House official said Iran will have access to some $50 billion worth of assets that were frozen by the United States. 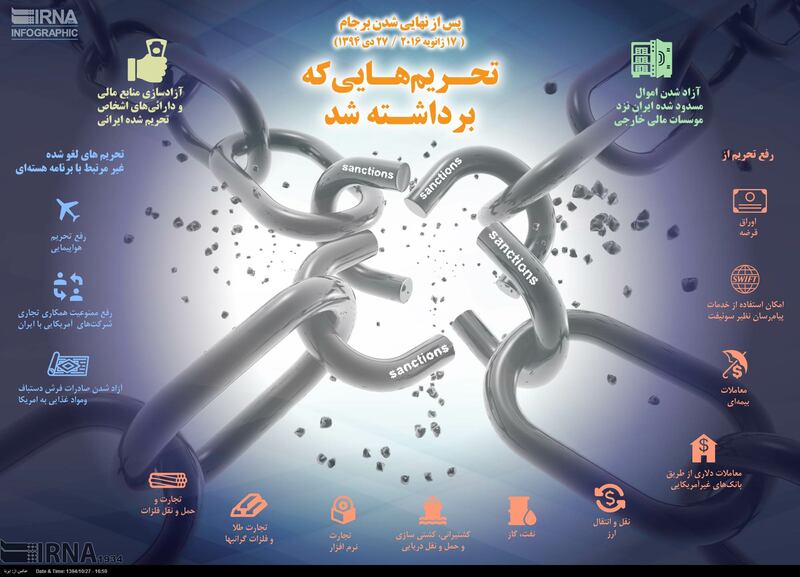 The United States also removed more than 400 Iranian individuals and entities from its sanctions list, the Treasury Department announced. Some 200 individuals and entities remain under sanction, the announcement said. 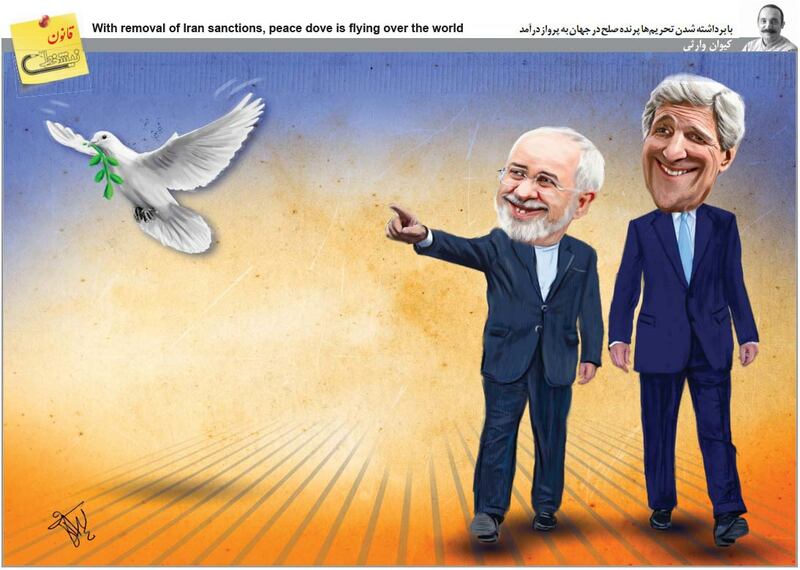 Iranian President Hassan Rohani posted on his Twitter account: "Congrats on this glorious victory!" Average Iranians took to social media to express joy and relief at the lifting of sanctions and the easing of Iran's international isolation. Israel is staunchly opposed to the agreement with Iran. Prime Minister Benjamin Netanyahu's office issued a statement on January 16 saying Tehran has not given up its bid to acquire nuclear weapons and remains a destabilizing force in the Middle East. A United Nations arms embargo against Iran remains in place, as do trade restrictions targeting Tehran's ballistic-missile program. In Washington, U.S. President Barack Obama issued an executive order revoking U.S. sanctions on transactions by non-Americans with the Central Bank of Iran and the National Iranian Oil Company. The EU procedure for lifting sanctions is expected to be rapid. An official decision of the European Council, which brings together leaders of all 28 EU members, is required to finalize the process, together with a publication in the EU's Official Journal. The total international sanctions relief for Iran is worth an estimated $100 billion. The announcement of implementation comes shortly after the International Atomic Energy Agency (IAEA) said earlier on January 16 that Iran had complied with its preparatory commitments under the nuclear deal signed between Tehran and six world powers in July. IAEA Director General Yukiya Amano issued a report concluding that "Iran has completed the necessary preparatory steps to start the implementation of the Joint Comprehensive Plan of Action." To meet its preparatory commitments under the July deal, Iran was required to slash by two-thirds its uranium centrifuges, reduce its stockpile of uranium, and to remove the core of the Arak reactor which could have given Iran weapons-grade plutonium. Prior to the deal, Iran had enough enriched uranium for several bombs. The July deal between Tehran and six world powers is intended to extend to at least a year the length of time Iran would need to make one nuclear bomb's worth of fissile material. Iran's nuclear program will be subject to close IAEA inspections to assure ongoing compliance. The West had accused Iran of pursuing a nuclear bomb, something Iran denied. The sanctions levied on Tehran over its nuclear activities had cut off Iran from the global financial system, significantly reduced the exports of a major oil producer, and imposed economic hardship on ordinary Iranians. The nuclear deal is opposed by all of the Republican candidates vying to succeed Obama in the U.S. presidential election in November. It is also viewed with deep suspicion by U.S. allies in the Middle East, including Israel and Saudi Arabia. But the deal is supported by Washington's European allies, who joined Obama in tightening sanctions on Tehran as part of a joint strategy to force Iran to negotiate.